It is my great pleasure to meet so many friends from the 48 Group Club in my third week in London. I want to thank Mr. Perry for his warm words of welcome and Chairman Reid for his thoughtful arrangements for today's lunch. The 48 Group Club is no stranger to me. Although this is just our first meeting, today's lunch is more like a reunion with old friends. I was posted for many years in the United States, but some British friends already warned me that the UK and the US are two countries divided by a common language. I was told I cannot expect the same political and economic system, way of life and even local customs are different. I am still in the process of exploring and learning. So if you have any suggestions for China-UK relations or for me personally, do let me know at any time. I just came from China. Presumably you would be interested to learn about China's latest developments. The National People's Congress and Chinese People's Political Consultative Conference have just held their annual sessions. The Chinese economy was right there among the top agenda items. Thanks to the 4 trillion Yuan economic stimulus package, China's GDP grew 8.7% in 2009. According to a UN report, if China' GDP increased 8% last year, China would have contributed 50% to the global growth. Now it appears that this "if " is a reality. Yet there is no complacency on the part of Chinese leaders. Premier Wen Jiabao repeatedly used words like complexity and uncertainty to describe China's economic prospect this year. This is quite true. Uncertainties in global economy have been on the rise. Leading economies are not out of the woods yet and there is still the possibility of 'double dip'. Many Chinese companies still rely on policy support. Furthermore, restructuring and the reorientation of the economic model take time. Imbalances and lack of coordination and sustainability still hamper the Chinese economy. Looking forward, promoting growth, keeping inflation at bay and restructuring will be the triple themes for the Chinese economy. The Chinese government will continue its pro-active fiscal policy and moderate easing of monetary policy to achieve 8% growth this year. It will pay careful attention to preventing inflation and asset bubble and push for further progress in economic restructuring. China takes the UK as an important partner in its development process, and as such places much importance on its relations with the UK. Our relations have gone way beyond the bilateral level, and are taking on strategic and global significance. There is all the more need now for the two countries to promote sustained global recovery and stand against protectionism. Now there is an argument that China's RMB is undervalued to gain more competitive advantage in trade. Nothing could be further from the truth. Between July 2008 and February 2009 at the height of economic difficulties, RMB appreciated by 14.5% against the dollar. In 2009, while China's exports decreased 16%, its import only decreased by 11%, cutting its trade surplus by 102 billion US dollars. Last year US and EU exports fell by 17% and 20% respectively, yet the fall in their exports to China was only 0.23% and 1.5% respectively. A stable RMB best serves the interest of the global economy. Naturally China will not waver in its reform of the exchange rate mechanism and will continue to make RMB more flexible and at the same time basically stable. Two-way trade and investment between China and the UK enjoy a broad prospect. Over the past three years, China's investment in the UK grew nearly six-fold, and the UK is both the largest EU investor in China and the largest recipient of Chinese investment in the EU. The UK leads the world in financial services, manufacturing, creative industries and low-carbon economy. Chinese companies have become much more willing and able to go overseas these days. Our trade and investment relations hold great promise in at least the following four areas. First, strong consumption demand in China. More than half of GDP growth in China last year was contributed by consumption. The Chinese have a keen appetite for high-end cars and luxury products, among others. China will continue to cultivate leading new areas in consumption growth, such as information, tourism, culture, and all kinds of services, and we are certainly ready to import more from the UK. Second, low-carbon economy, which is a priority for both countries. Britain leads the world in clean energy and low carbon technology. China is committed to raising energy efficiency and cutting down emission. We will work closely with the UK to implement existing cooperation projects including the carbon capture and storage, the innovation programme and the sustainable city project, and further broaden scientific and technological cooperation on addressing climate change. Third, the Shanghai Expo, which will be open in 43 days. It will attract 70 million visitors and more than 240 countries and international organizations will participate. The UK pavilion will be one of the highlights for the event. And a detailed programme of more than 100 business and cultural events has been drawn up by the UK. I am confident that the Expo will give a big boost to bilateral cooperation in a variety of areas. Fourth, industrial upgrading in China. The Chinese government announced a plan to restructure ten major industries such as automobile, steel and textiles. The UK is a strong manufacturing powerhouse in many fields. Closer cooperation in technology and R&D between China and the UK will contribute in no small terms to China-UK trade and investment. Having said all that, we need to work even harder to turn these potential into reality. There are still challenges along the way. Our two-way trade accounts for less than 1% of China's trade and less than 4% of UK trade. Due to language and information barriers and lack of expertise, business communities in the two countries are still struggling to get more inter-connected. The UK pays more attention to the market access for services, while China places priority on trade. Most of our projects for economic cooperation are still small in scale. There are still restrictions in place on UK's high-tech exports to China. 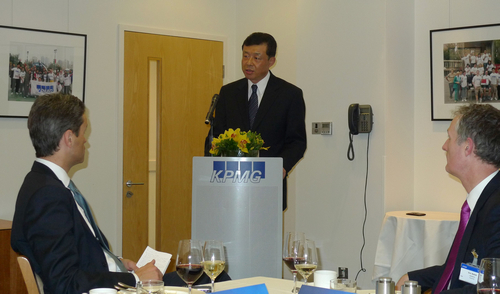 The 48 Group Club and companies like the KPMG have a big role to play in the development of cooperation between China and the UK. I am pleased to see that the ice-breaking spirit has been passed on to a new generation. My colleagues and I will continue to work with the 48 Group Club and KPMG to tap into the potential of trade and investment and strengthen China-UK relations, to the benefit of the two peoples.